Titus Flavius Domitianus was born in Rome on October 24, 51 AD, the son of Titus Flavius Vespasianusand Flavia Domitilla. He was the younger brother of Titus. During the reigns of his father and brother, Domitian was kept very much in the background remaining at home when his father and brother marched off to the East. Domitian became a pawn during the Civil War by the Emperor Vitellius who ordered his arrest in hopes of holding off his father who was marching upon Rome at that time. However, Domitian managed to flee with his uncle Flavius. Vitellius’ troops pursued Domitian and his uncle and they came under siege, but managed to escape once again. Domitian finally made it to the advancing forces of his father and soon thereafter, Vitellius fell from power. Under his father’s reign, Domitian found himself embroiled in heated arguments with Mucianus over appointments he had made in the administration of the city. Throughout his father’s reign, Domitian received little honor or attention as Titus grew in fame and glory. Cassius Dio claims that upon his father’s death, Domitian accused his brother of altering the will in favor of himself. Domitian argued that his father wanted them to rule jointly. It is hard to say that this is truth of mere rumor. Nevertheless, Domitian remained at his brother’s side with the rank of Caesar. 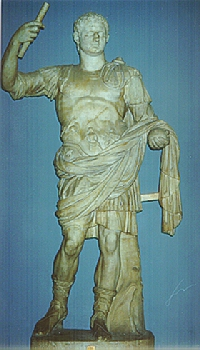 Upon the death of his brother Titus in 81 AD, Domitian’s succession was not disputed. There was some speculation that Domitian may have helped advance his brother’s death by placing him in a tub of ice to bring down his fever. However, there is not conclusive evidence to that effect. When Domitian first came to the throne, he displayed what many held to be great promise for the future given the past records of his father and brother. However, Domitian soon offended Senatorial nobility by his affection for Greek arts and attire. Domitian took the office of Censor, which gave him control over the Senate’s membership list and behavior. The Senators responded with numerous plots and conspiracies. Domitian was suspicious by nature in almost evesry aspect of his life. His view of the Seante was one of distrust. Domitian launched military campaigns against the Chatti in 83 AD and then against the Dacians who invaded the provence of Moesia. Domitian returned to Rome where he celebrated a double triumph. Domitian returned to the German frontier, but was robbed of a victory due to the revolt of Lucius Antonius Saturninus in 89 AD who was commander of the legions in Germania Superior. The legions of Germania Inferior under the command of Lappius Maximus marched against Saturninus and defeated him. Despite problems with revolts, Domitain knew that his power resided with his legions. He therefore increased the pay of the soldiers. His popularity among the troops was greatly increased and Domitian began to wear military atire even when he was in Rome. Domitian was a great admirer of Tiberius and saw himself in the position of his mentor, besieged with consiracies and plots. Domitian began to arrest and execute even popular and distinguished men within Rome on charges of conspiracy. Philosophers, including Epictetus, were banished from Rome. Many wealthy citizens were executed and their assets confiscated. He evn suspected his wife Domitia and at least divorced her, although he had planned to execute her as well. With his wife banished, Domitian became attracted to his niece, Julia Titi (daughter of Titus). After executing her husband, she moved into the palace with her uncle and fulfilled the role of mistress. When she became pregnant, Domitian forced her to have an abortion, which she did not survive. Domitian is also remembered for several building projects. Besides completing the construction of the Colosseum, he also erected several temples. He also built the Palace of the Emperors on the Palatine Hill, which remain in use for 200 years until the time of Diocletian in the late 3rd century AD. The Stadium of Domitian was also constructed over the site of the Campus Martius where Caesar and Augustus had built a wooden stadium. This was restored by Nero in wood and Domitian rebuilt it in stone and brick. 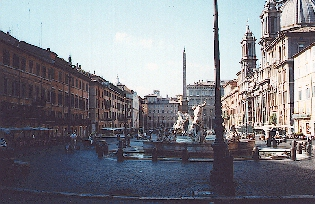 Today, the outline of the stadium can still be viewed as the Piazza Navona. The final years of Domitian’s reign, from 93-96 AD, were ones of sheer terror and oppression. Insanity was clearly a part of his personality problems at this stage as evidenced by his open claims that the Goddess Minerva was his mother. He was reconciled with his wife Domitia following the death of Julia Titi. As the story is told, Domitia found her own name on a list of conspirators and took the list to the Prefect of the Praetorian Guard. A plot to assassinate Domitian was then born. Domitian was eventually murdered in his palace on September 18th, 96 AD. The plot was indeed a real conspiracy involving his chamberlain, the Praetorian Prefect and, according to historian Cassius Dio, his wife Domitia. Lacking an heir, Domitian had consulted astrologers as to who would succeed him. They responded – Nerva. However, given the fact that Nerva was older than Domitian, he never took any action toward him. Upon the death of Domitian, Nerva was immediately offered the throne and he accepted. 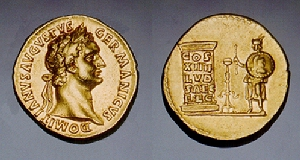 It is possible that Nerva may have played some role in Domitian’s assassination. As for Domitia, she lived in comfort and with the respect of the Roman people and Nerva.